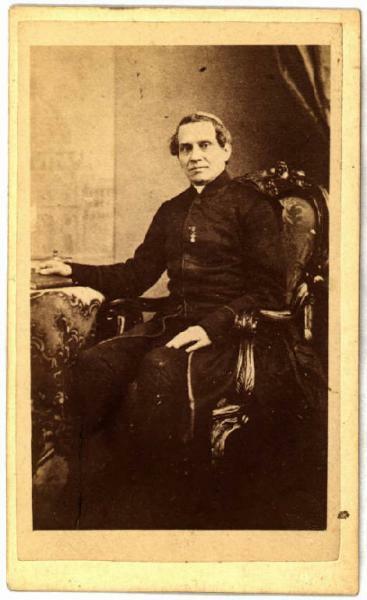 Giacomo Antonelli was born on April 2, 1806 at Sonnino and was educated for the priesthood but chose an administrative career. As a secular prelate, he was sent as an apostolic delegate to Viterbo in 1836 and was then transferred to Macerata. In 1840 he was ordained a deacon and soon recalled to Rome by Pope Gregory XVI where he entered the office of Secretary of State. Within four years, and after being appointed as pontifical treasurer-general, he was created cardinal on June 11, 1847. He was one of the Church’s last true cardinal deacons: in 1918, a declaration by Benedict XV required that all cardinals must be priests. Pope Pius IX (1848-1878) appointed him to serve as his Secretary of State. He appointed Antonelli President of the newly organized Council of State and was entrusted with drafting a constitution for the Papal States. He subsequently held many positions, and after the death of Rossi arranged the flight of the Pope to Gaeta, where he was made Secretary of State. During the period of Cardinal Antonelli’s greatest influence, the war of national liberation was being waged in Italy. In 1848 the Papal States were overthrown by Liberals and replaced with a Roman Republic. They were restored to the pope in 1849 with the aid of French and Austrian arms instigated at Antonelli’s request. Cardinal Antonelli restored absolute government upon returning to Rome in 1850. He then violated the conditions of the surrender by imprisoning Liberals. In 1855 he narrowly escaped assassination. Giacomo Antonelli was an Italian cardinal deacon who was the papal Secretary of State from 1848 until his death in 1876. He played a key role in Italian politics, resited the unification of Italy and affected Roman Catholic interests in European affairs. He was often called the Italian Richelieu. The carte de viste, or CDV, was a type of small photograph which was patented in Paris, France by photographer André Adolphe Eugène Disdéri in 1854, although first used by Louis Dodero. It was usually made of an albumen print, which was a thin paper photograph mounted on a thicker paper card. They are of a specific size, usually about 2 1/2 inches. In 1854, Disdéri had also patented a method of taking eight separate negatives on a single plate, which reduced production costs. The Carte de Viste was slow to gain widespead use until 1859, when Disdéri published Emperor Napoleon III’s photos in this format.This made the format an overnight success, and the new invention was so popular it was known as cardomania and eventually spread throughout the world. Each photograph was the size of a visiting card, and such photograph cards became enormously popular and were traded among friends and visitors. The immense popularity of these card photographs led to the publication and collection of photographs of prominent persons. Cardomania spread throughout Europe and then quickly to America. Albums for the collection and display of cards became a common fixture in Victorian parlors. 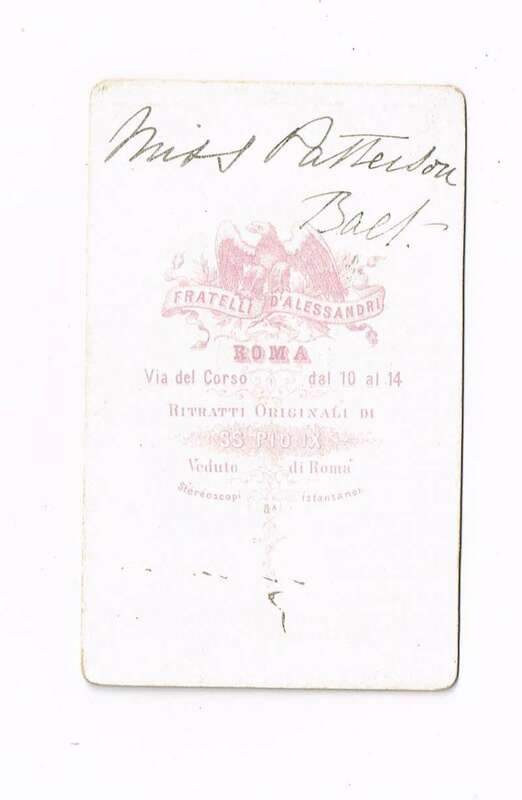 If you are able to procure an item from the Vatican that is an actual formal work of the Vatican that’s really rare because normally they hold onto items such as this. 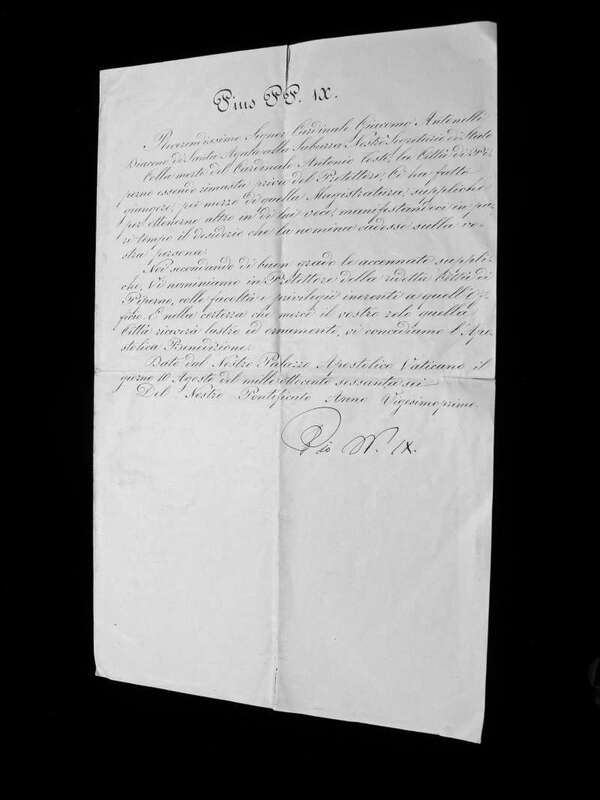 This is a very large formal document appointing Pope Pius IX’s Secretary of State, Giacomo Antonelli (1806-1878) a Cardinal Deacon to the Deaconry of St. Agata alla Suburra on June 14th, 1847. It is the original letter. If you look closely it has gilt edges on it, and then it is signed with his big Pius IX signature, Pio Nono, as he was well known. So it is one of the few documents that are in this Collection that are really quite historical. If you were to read a biography of Pius IX, or of his Secretary of State, this document would be part of the information you’d read. Political conditions during this time continued to escalate in favor of a united Italy independent of Papal control. Cardinal Antonelli remained in the forefront of the issues. He attempted to assure Vatican control over the states by receiving aid from the French and also by using devious means, such as fomenting brigandage on the Neapolitan frontier. At various stages of this unrest, between 1860 and 1867, he ruled supreme. However, with the entry of the Italians in 1870 he was obliged to restrict his activity to the management of foreign relations. It is he who wrote, with papal approval, the letter requesting the Italians to occupy the city of Rome and obtained from the Italians payment of the Peter’s pence (5,000,000 lire), and 50,000 scudi, the only installment of the Italian allowance ever accepted by the Holy See. 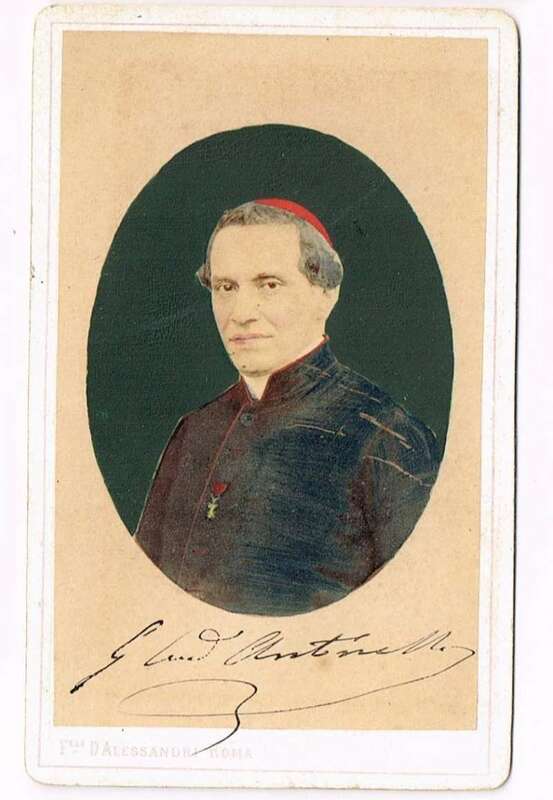 Cardinal Antonelli died on November 6, 1876. The Vatican finances were found to be in disorder, with a deficit of 45,000,000 lire. His considerable personal fortune was bequeathed almost entirely to members of his family. He left little to the Church and a trifling souvenir to Pope Pius IX. Although he interfered little in affairs of dogma and church discipline after 1850, he did address to the powers circulars enclosing the Syllabus of Errors and the acts of the First Vatican Council. His activity was devoted almost exclusively to the struggle between the papacy and the Italian Risorgimento. His life during this period is inextricably bound up with the history of the reign of Pius IX. Until 1870 he was practically the temporal ruler of Rome, being charged by Pius IX with the care of public interests, that the Pontiff might devote himself more exclusively to his spiritual duties. It is impossible as yet to form a just estimate of the works of Antonelli, or to reconcile the extravagant praise of his admirers with the vituperations of his enemies. It must be said that he defended vigorously the rights of the Holy See, won the respect of princes and statesmen for his diplomatic ability, and showed himself fearless, braving alike public opinion and private jealousy. In extenuation of the charge that his aim was to a large extent personal aggrandizement, it must be recalled that he was a statesman rather than a prelate, and that he was not a priest, although most assiduous in the discharge of his religious duties.